The NF Railway is leaving no stone unturned to help people affected by the Assam floods, even they running relief sorties on trolleys in flood hit areas. The railway providing relief in the form of food, medicines, transporting them to shelters etc. Stations in Assam, like Katakhal, were used to 14 trains, and around 500 passengers passing through on a regular day. Now, for the last week, there have been no trains, but about 1200 people are on the platforms, seeking shelter from the torrential downpour and floods that have wreaked havoc in Southern Assam. 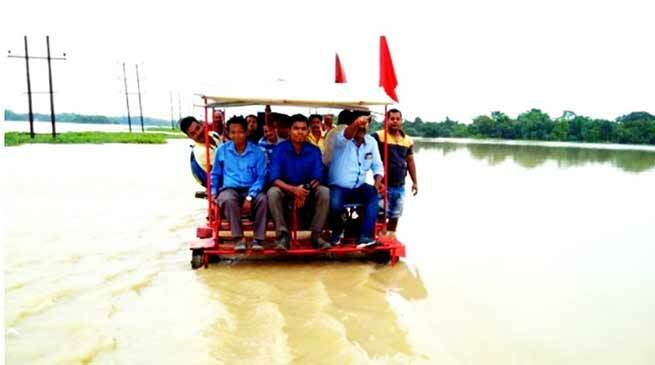 According to NFR Headquarters spokesperson Pranav Jyoti Sharma, railway officials and security personnel ran sorties on motorised trolleys on submerged tracks. Boats were used to provide medicines, food and other relief material to people, who have taken shelter in the platform. Sharma also mentions that there are around 50 families taking refuge in railway coaches as well. In fact, the Railways has appointed 15 spare coaches, at Silchar railway station just for this. More than 400 other people have taken shelter in nearby smaller stations, like Salchapra—the Food Corporation of India’s railhead—and at Algapur. Even Silchar, southern Assam’s biggest city, has people seeking shelter from the rain.